Much more seriously, they were able to use "small stickers" on the ground to effect a "fake lane attack" that fooled the autopilot into steering into the opposite lanes where oncoming traffic would be moving. This worked even when the targeted vehicle was operating in daylight without snow, dust or other interference. After that we tried to build such a scene in physical: we pasted some small stickers as interference patches on the ground in an intersection. 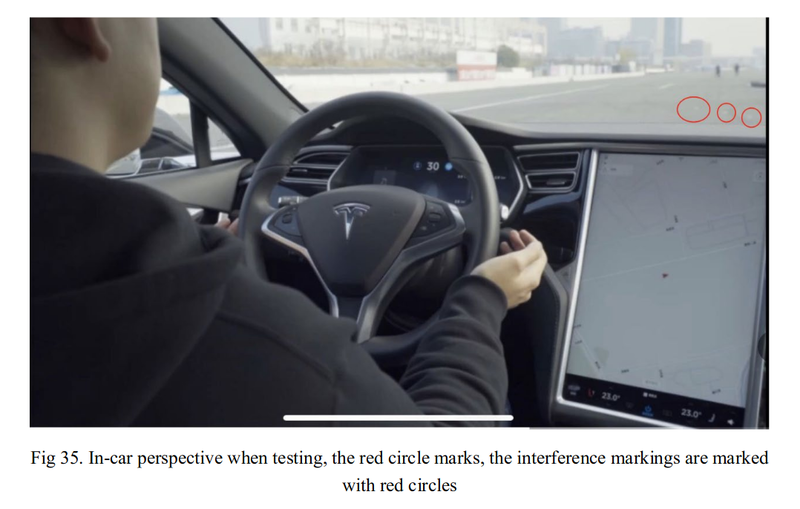 We hope to use these patches toguide the Tesla vehicle in the Autosteer mode driving to the reverse lane. The test scenario like Fig 34 shows, red dashes are the stickers, the vehicle would regard them as the continuation of its right lane, and ignore the real left lane opposite the intersection. When it travels to the middle of the intersection, it would take the real left lane as its right lane and drive into the reverse lane.